The Honda Amaze is powered by an advanced and reliable four-cylinder engine. MOTORING NEWS - A CVT drivetrain is somewhat divisive. Many motoring journalists are quite sanguine about it, but the petrolheads are outspoken about the lack of quick response. This, of course, means that the car needs more nurturing and planning - when overtaking, for example. I decided to take a comfortable position on the fence some years ago. This gives one ample opportunity to agree with everyone in accordance with the principles Dale Carnegie laid out in How to make friends and influence people. It is not just cynical self-interest and a lack of desire to argue on my side; a CVT has many advantages. It delivers a fairly smooth drive and Honda's version is better than many others. The gears take care of themselves and you can concentrate on traffic and your speed. On the downside, the gear changes are sometimes frustratingly slow and at the speed of 120km, the engine needs considerable prompting to give more when needed. The paddle shifts are some consolation but, unless a serious intervention becomes necessary, I would rather let an automatic take its course. Once used to this convenience, it would be hard to revert to a manual version. The Honda Amaze is powered by an advanced and reliable four-cylinder engine. The 1 199cc unit employs Honda's i-VTEC intelligent valve timing management system, ensuring optimum performance and fuel efficiency. The maximum power output is rated at 66kW, reached at 6 000r/min, combined with a torque peak of 110Nm at 4 800r/m. In the baseline Amaze Trend model, a five-speed manual gearbox is standard, while buyers of the Comfort model can opt for a new-generation Constantly Variable Transmission (CVT). This is the version we took for a short drive to refresh the impression left at the vehicle's launch. With a kerb mass of just more than 900kg, the Amaze can deliver swift performance and fuel economy. The CVT version is said to get from 0 to 100km in 13,5 seconds and the official petrol consumption is given as 5,7 litres per 100km. The test drive delivered a figure of around 6,2 litres - but strong winds required a little more enthusiastic application of the petrol pedal. The long, steep inclines between George and Mossel Bay also played a role. The car's top speed is given as 160km, but it was a struggle to get much beyond 120km. On the motorway the performance is more than adequate, but elsewhere, overtaking could be more tricky - hence my comment about planned driving. The owner would come to do this as a matter of course and the car is more than suited for short trips and a more leisurely approach on longer routes. The Amaze delivered smooth power in pulling away and the driver's seat is well placed, firm and comfortable. The car also has good all-round vision, although the rear-view mirror was prone to a little vibration at a higher speed on the motorway. The interior is roomy and elegant. The test version has two-tone leather seats which gives the interior a bit of oomph - although it may not be for everyone. This is an additional option on the Amaze. The windy day did not bother the vehicle too much and it felt comfortable and sturdy on the road. The steering was accurate and the size of the steering wheel felt and looked exactly right. The Amaze's new platform features an independent, McPherson strut-based front suspension and it delivers confident handling, while the electric power steering ensured good steering response. On overall looks and elegance the car gets top marks, although the wind noise around the rear view mirrors bothered me in a car of this refinement. This may have been due to the strong wind on the day. My co-driver and I did not encounter this during the launch last year. Honda has not skimped on the safety features. Extensive use of high-tensile steel ensures a lightweight but extremely rigid construction. The car also features Honda's advanced compatibility structure, which allows for specific, programmed deformation of body structures in the case of a collision, ensuring the integrity of the passenger safety cell. All Honda Amaze models are fitted with dual front airbags, inertia reel seat belts front and rear and IsoFix child seat anchors. On the active safety front, ABS brakes with electronic brake force distribution (EBD) are standard. Central locking is standard and Amaze has automatic air-conditioning and electric adjustment of the exterior mirrors, as well as automatic door locking once the vehicle starts moving. Exterior features include 15" alloy wheels, a roof-mounted shark fin antenna and a high-mounted third brake light. The four-speaker audio system features FM/AM and MP3. There is Bluetooth connectivity for audio streaming and hands-free telephony. 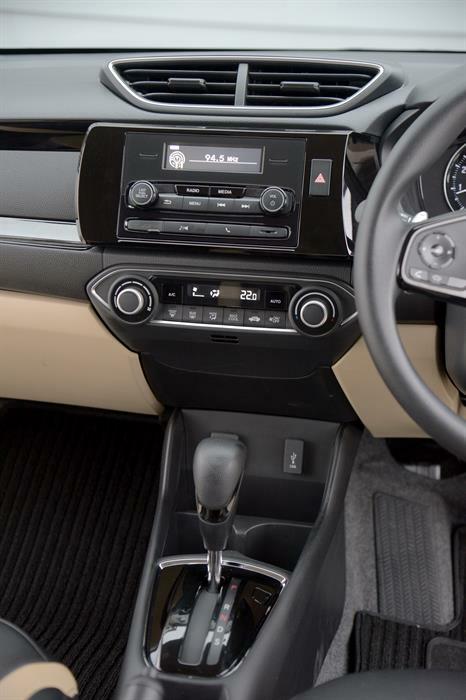 The 1,2 Comfort CVT has gearshift paddles behind the steering wheel to allow for manual shifts between the CVT's virtual gears. All three Honda Amaze models are available in a choice of four colours: White Orchid Pearl, Lunar Silver Metallic, Modern Steel Metallic, and Radiant Red Metallic. 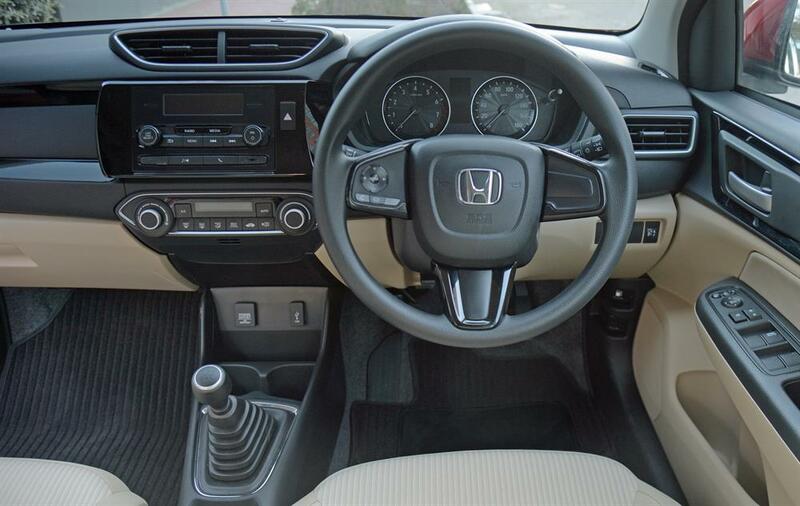 The Honda 1,2 Comfort CVT's recommended retail price is R208 900. The range is supported by a full five-year or 200 000km warranty, as well as a two-year of 30 000km service plan and a three-year AA Roadside Assistance package. Scheduled services are at 15 000km intervals. The Amaze was made available for the test drive by Honda Auto George. For more information, contact them on 044 803 7900 or visit the showroom on CJ Langenhoven Street.